You are being gently reminded not to get caught in the chaos of the adult world where fear, greed, and suffering are commonplace. In this case, porcupine symbolism is letting you know that it is time to free yourself from guilt and shame. In doing this, you can reclaim the innocence that you left behind as a child. To do this, you must open your heart to those things that gave you joy as a child. Like the seal, remember fantasy and imagination so that you can bring it into your life again. Also, the porcupine meaning asks you to make sure that you do not get caught up in the chaos of the world, where fear, greed, and suffering are commonplace. Porcupine symbolism also reminds you that you that protection is always available to you. Therefore, it is time to be yourself, and trust that it is safe to be who you are. The focus here is on faith and trust and the knowing that you can move mountains with these powers. Alternatively, porcupine symbolism reminds you that you should never allow other people’s opinions to prevent you from exploring activities that could otherwise be fun and enjoyable. In other words, you are overly sensitive to their barbs. Furthermore, it may be that these are old wounds that still aggravate and sting you. In other words, it may be necessary to remove the old barbs, no matter how painful, so they do not fester and poison the system. Occasionally porcupine meaning is also a reminder that we must be careful of how we use our words. Thus, it is possible that you are inappropriately taking the joy from others with your barbed sentences. People with the porcupine totem, like the grizzly bear, can be overly sensitive to criticism from others. They can also be excessively critical of others. Furthermore, they tend to allow barbs from long ago to affect their life now. Folks with this spirit animal totem often crave and overindulge in salt intake. They need to be aware of this and watch their intake. 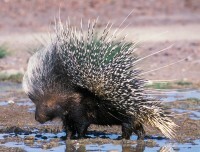 People with the porcupine totem also have a knack for sticking it to people if they get intensely aggravated. Thus they will say or do that which will cause the most hurt for the longest time. They use words like a quill barb that works its way deep into the skin. However, they do not always use it, but when they do the point is well taken. Conversely, they know exactly how to resist the barbs of others and set their boundaries. They are also willing to show strength through their vulnerability. When you have a porcupine dream it suggests that you need to look out for yourself and protect yourself from emotional or psychological harm. Trust and honesty are important qualities but only with boundaries fully intact. Alternatively, a porcupine dream indicates that there is a situation that you need to approach with openness. In other words, someone in your waking life may be on the defensive. Thus they are not exposing their vulnerabilities. Like the hedgehog, to see this rodent in your dream can also suggest that your defense mechanisms are working overtime. In particular, you are metaphorically bristling at any new ideas, possibilities, or relationships for fear of failure or being hurt. It could also be that you are threatening others in order to get your own way. It’s time to free yourself of guilt and shame and reclaim the innocence that you left behind as a child. Open your heart to those things that gave you joy as a child; remember fantasy and imagination and bring into your life again. Make sure that you do not to get caught in the chaos of the world, where fear, greed and suffering are commonplace. Know that you are protected and that protection is always available to you. It’s time to be yourself, and trust that it is safe to be who you are. The focus here is on faith and trust and the knowing that you can move mountains with these powers. I would be using it in my next book with a working title, Two Roads. Thanks for the information on your copyrights. Once at the library Amanda pulled out her computer and looked up porcupine as a totem animal expecting to find something about being prickly and offensive. Amanda sighed approval as an honored porcupine dismissing the negative comments in the article. Then she checked retail stores in Thunder Bay. Walmart and Sears, mirrored the stores back home. She applied to both of them. I had a dream just the other day about a porcupine. In my dream, it as at night and I was doing something in or near my garage. my backyard I have bushes along the side of the garage. I can’t remember if there was anyone with me. All I can remember was I heard something in the bushes and out of no where my leg ended up in the bush and when it came out there were a bunch of quills stabbed into my leg. I jumped back but didn’t see to be in to much pain, witch i found interesting. Then one porcupine came out and looked at me and went back into the bushes. I had a long wooden stick with me and I opened the bush and saw 2 more porcupines. They were just staring at me and walking around and their quills were flat. Then I woke up and was thinking that was the most interesting dream I’ve ever had. could anyone give some incite on this? The other night I had a dream a porcupine got inside my house and I was trying to get it out because it was freaking out my dog; I was running around trying to protect my dog not letting it close to it but at the same time opened a door n tried to get the porcupine out. The porcupine got scared and it spiked us with its quills. It hurt and I grabbed my dog and removed them right away off of her but I still felt quills on me. Porcupine, Anén:taks, speaks of Childish Joy and of remembering that there is always an Inner Child within us that must be given occasional voice. My Haudenosaunee Ancestors used the quills of Porcupine to sew beads and costumes for Dancing. Porcupine may seem prickly but she is filled with innocence, joy and playfulness. And when we are wounded by the barbs of others we begin to silence our Innocence and Childishness. These barbs may be painful but they will not kill us, unless we allow our pain and fear kill our Innocence and Playfulness. I have been walking in darkness of late, but Porcupine reminds me that I still have to laugh and I still have to Play, and it is that Playfulness that will heal the heart and the spirit. Anén:taks reminds me that laughter, Dancing and Play are as important to celebrating life as could be. Of course there is pain. Of course there is grief. But the surest way to heal from those things is to remember to Play. 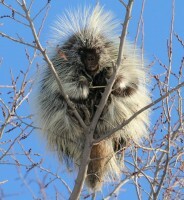 My son and I have been trying to lose weight and on one of our walks going up the hill in Nosehill park in Calgary Ab we saw our a porcupine walking slowly toward us on the path as we were about to go down the hill and exit the park. The symbolism of this porcupine means a great deal as we have been trying to get healty for a year now . The freeing of guilt and shame is big since we both suffer from those things lol. gives me hope. I dream I had 3 types of animal living under a bed in my house, one was a cat, porcupines, and what seems to be aligater eggs that had not hatch yet, in the dream we were saying it was an aligater and was looking for the mother that was never found, the eggs never hatch so I’m not for sure if it was actually an aligater, but through out the dream we were clean up under these beds to find these animals and the mother to these eggs, the whole dream, what does this dream mean. No matter what kind of eggs they were, eggs symbolize birth, and you were looking for “the creator” of the eggs or the one who has the power to create. That is you. What do you need/want to create? I think the cat and the porcupine might be your guides and have information to help guide you in your creation process. I would read about both and see what jumps out at you. Have fun creating! last night I dreamed of a porcupine, it had very very sharp prickles, but the more I considered these prickles the more entranced I became in them and then Ir ealised that these were the prickles of a damaged mind, a thread that was coming unwritten, a cake that was not bakedd. These were my OWN prickles. I was the porcupine and yet I still felt human. yet I still felt animal, somewhat primeval but also human. What does this mean? am I going to be able to find way to a stable forest of my own mind and not feel so isoolated and attacked that I must defend with my dreamy prickles. Where does the porcupine sit on the medicine wheel? Someone recently gave me a Porcupine as my Power Animal. Reading the meaning here made perfect sense. i need to incorporate porcupine’s energy into my daily life due to the struggles i am currently facing . How can i do that? I would not allow other’s words and gestures get me (I know…easier said than done!). Have you ever read the Four Agreements? Years ago it helped me to detach myself from other’s criticism and actions. Since the Porcupine came to me today maybe I need to re-read it. Good luck! Wow had a dream last niget about one. Before bed I was upset people are thinking less of me because I have started drawing dragonballz and collecting pokemon cards after I quit a job working 12 days as a nurse. I was misrable now I feel a curtain type of innocence in my heart. Thanks for this absolutely amazed. A porcupine just walked by my husband and I like eight feet away, seemingly unaware of us. We found this page as we searched for the spiritual significance of this creatures appearance in our experience. It was amazingly applicable to our day. Thank you!!!!! 😛 Thank you so very much for this elucidating site. It is helpful to those like me who seek to understand the wonderful world of nature, especially animals and their messages/symbolism, to help us humans “get it together”. Endless blessings to you.